Nice looking frame, the honey stain and the gold inlay really make this frame pop. Looks great with my diploma inside it, and it appears that it will last, well built. My first review ever. I had this made over the internet with a picture my Brother sent me from the world series of him and his son. I thought it was going to be a 5X7 but it was about 11X14 I'm not sure it was big I told them to make it as big as they could with the picture I was sent to me on my phone. I thought my Brother was making a joke when he kept saying how great it was. He put it up in his living room he said he could not believe it when he opened it.He said it was so nice. My Brother has a lot of money I did not ever think I could get him any thing he liked so much, telling ever one it was his favorite present. I was very suprised and pleased with the quality and value. I will certainly use your company again. A beautiful custom frame for an oil on canvas painting I purchased in Italy. Quality is good. I give 4 star because the first time they sent the frame to me without clear Acrylic or frame. After complain with through the email, they asked me to take picture and then they sent me the missing parts. The shipping is quick, and I am quite happy about the shopping. 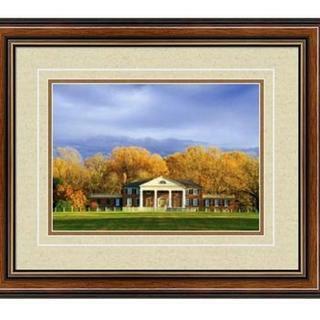 I chose this frame because it framed a photo beautifully that my brother recently took of Montpelier. The rich colors of the frame blended so well with the photo as did the mats. Each complimented the others (the photo, the frame, and the mats). This is a beautiful frame and very reasonable. I loved it from the moment I found it on the PictureFrames.com website, from the rich colors, to the very polished and finished and professional look. I would recommend this frame to everyone. Handsome product. Quality construction. UV Protective Acrylic and Acid-Free Foamcore Backing worth the investment, when artwork assembly completed. Will buy same frame to unify artwork, as part of two wall display feature to replace existing older/less expensive serviceable frames currently in use. Stroke of luck to discover your company and achieve such positive initial results from purchases made. Good value - great frames! This is just what I needed to frame an old document. Stately without being overwhelming. Purchased two of these frames for a college diploma and and a professional license. They are exactly what I was looking for and look every bit as nice -- if not nicer -- than most of the "professionally framed" documents I have seen. I love this frame for paintings that really call for wood rather than metal. This is a very nice-looking frame, and plenty sturdy as usual from pictureframes.com. It is very shiny, so that may or may not be what you want, and is something you should consider before buying. Personally, I would love it if they offered it in a matte finish. Have used this frame in the past and it looked very nice with the piece that was in it. 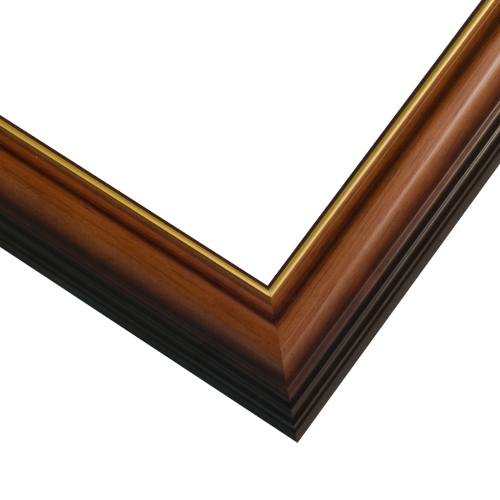 Nice looking frame that should go well with my painting. Suggested frame was a very good fit for the picture. I like the width and the sheen of this frame. To match other frames purchased from you. Quality is good and I like the look with the maps I am framing. Really made my painting stand out with a rustic type elegance. how much is oversize shipping? BEST ANSWER: This is tough to answer. I had a rather large Order and the shipping was $84 plus oversize was $14.50. Oversized is a combined measurement of 50 inches for all four sides together. On this order I had five frames that were over. So I don’t know if the $14.50 was a one time charge for oversize or if you divide by five it’s three dollars each. Maybe you should call the company to get more specific answers conducive to your order. It depends on the size of the frame as there are several tiers to accommodate various shipping needs. If you would like to call chat or email with the specifics of your project we can give you an accurate estimate.